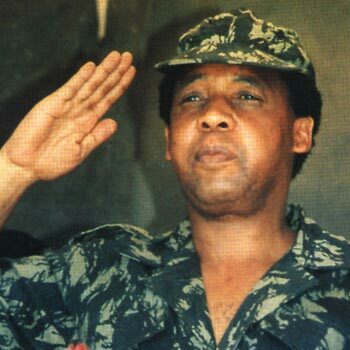 April 10, 1993 Chris Hani, leader of the South African Communist Party and Chief of Staff of the armed wing of the African National Congress, was assassinated. Born Martin Thembisile Hani on June 28, 1942 in the small town of Cofimvaba, Hani joined the ANC Youth League at the age of 15. He also studied modern and classical literature at the University of Fort Hare and earned his Bachelor of Arts degree from Rhodes University. Following his arrest under the Suppression of Communism Act, Hani went into exile in Lesotho in 1963. He returned to South Africa in 1990 and in 1991 became head of the South African Communist Party. During this time Hani was the most popular ANC leader after Nelson Mandela. A township and municipality in South Africa are named in his honor and in 1997 one of the largest hospitals in the world was renamed the Chris Hani Baragwanath Hospital in his memory.